This the third installment of a weekly segment looking at the bills being introduced in the Georgia Assembly that involve land use, environmental, and transportation issues. Please see the 2015 Legislative Session page for ongoing coverage. 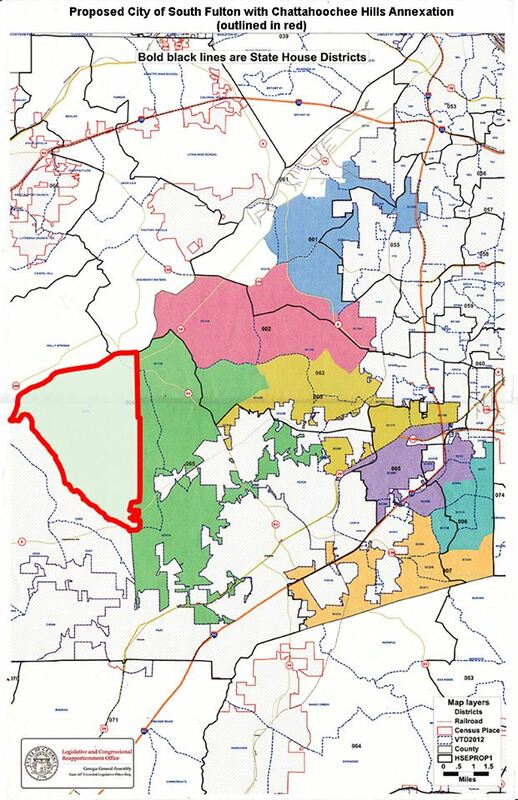 Map of Proposed Districts in the City of South Fulton (with an annex outlined in red). It appears to create an island of unincorporated area, which is something HB-11 seeks to prevent. Welcome, City of South Fulton! Well, not quite, but should HB-165 be approved by the Georgia Assembly, signed by the Governor, and approved by referendum of voters we could soon be welcoming that municipality. The City of South Fulton would consist of a large portion of unincorporated land in the southern part of Fulton County with the population totaling about 90,000. Keep in mind that another bill introduced earlier this session would prevent the boundaries of new cities from creating islands of unincorporated land. The AJC had an article last year that looked at the proposed city. Last year a similar bill passed the House by a vote of 163-2, though back in 2007, 85 percent of residents voted against forming a City of South Fulton. Many communities in South Fulton are being courted by both the City of Atlanta and the backers of the proposed City of South Fulton. The bill is currently in the Governmental Affairs Committee. Sadly, one city may be lost as the Senate introduced a bill, SB-11, to eliminate the City of Payne in Bibb County. This may make some sense since the City is completely encompassed by the City of Macon. As the legislative session continues, expect to see a few more bills either creating new cities or expanding cities in the Atlanta metro region. Now for an update on the Transportation Funding Act of 2015. Last week ended with the House subcommittee on Transportation approving the Act, which allowed it to progress to the full Transportation Committee. However, there was also news from Representative Jay Roberts that the Act would be changed to address some of the concerns voiced by local politicians that the Act would severely reduce local funding options. For a more in-depth look at the Act please see last week’s article. As of this point, the proposed changes probably won’t satisfy local governments. The Act, as introduced, involves the State swallowing all the local gas tax revenue for one state-wide tax. It also allows local governments to enact, by ordinance, a tax of 3 cents per gallon on top of the 29 cents that the State would enact. Local governments can add an additional 3 cents per gallon, but it must be done by referendum. The proposed change is that the local governments will now be able to enact the entire 6 additional cents by simple ordinance instead of relying on a referendum for half of it. All the money still has to be used for transportation, though. The problem is that currently local governments can use the additional revenue from local gas taxes for schools as well as for transportation; the Act not only reduces the amount of additional taxes local governments can impose (from 9 cents to 6 cents), but also restricts the use of revenue to transportation. The proposed change to the Act appears to do nothing to alleviate the reduced revenue for schools. The changes to the Act are currently being discussed in the House, so there will be much more to discuss next week. HB-57: Financing of Solar Energy. Passed the House! The bill cleared its first hurtle in less-than-dramatic fashion by passing the House by a vote of 165-0. Next stop is the Senate. HB-4: Transfer of Water into the Metropolitan North Georgia Water Planning District. This bill is currently in its first read in the Natural Resources and Environment Committee. HB-11: Preventing the Boundaries of New Cities from Creating Islands of Unincorporated Areas. This bill is currently assigned to the Governmental Affairs Committee. HB-21: Abolish a Population Requirement for the Creation of the Transit Systems. This bill is currently in the Transportation Committee.